Just because you have curves does not mean you are resigned to wearing "mom jeans"! Put those saggy, tapered, unflattering jeans in the trash and move on up to the newest craze in denim: designer plus-size jeans. Women have spoken and designers everywhere have rose to the task of creating hot denim for curvy girls. The Svoboda label is at the top of the heap for designer plus-size denim. These trendy dark wash "Simone" jeans by Svoboda (left) have the hand detailed, soft denim look and feel that has become the hallmark of designer denim, but they are made to flatter a woman with curves. They are available in sizes 14W to 26W-plus and are plenty long enough to wear with your favorite heels. In the high-tech arena, the Not Your Daughter's Jeans line is working miracles. These super flattering, slightly flared Stretch Jeans (right) feature Mastoloni's signature criss-cross fabric to control the tummy and lift the behind. When paired with the slimming dark wash, the results are fantastic! You would never know by looking at these hot jeans that lurking just below the surface are all sorts of high-tech figure enhancers! 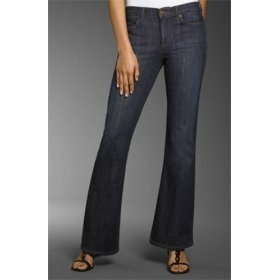 These jeans are available in sizes 4-16 and 14W-26W. 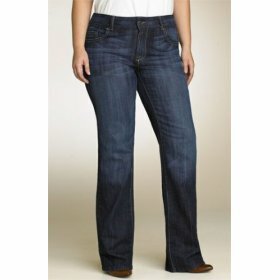 Click on either photo to link directly to where you can purchase those ultra chic plus-size jeans from Nordstrom via Amazon.com.